The Penn Museum sometimes feels like a world away from the rest of campus. 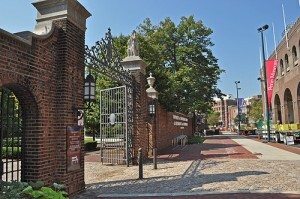 And yet the building is sandwiched between Franklin Field, HUP, and Penn Park. Is there a mental wall keeping the Museum at a distance? Or, could it be the brick and mortar wall in front of our building? Whatever the issue, the Museum wants to be an integral part of the University, enriching the lives of Penn students and the courses taught by Penn faculty. Who do we want to come? In addition to students and faculty visiting our exhibition galleries, we see them at film screenings, lectures, concerts, and, of course, the annual New Student Orientation toga party. We are a social gathering space, a cultural institution, and a forum for discussion. We are just on the other side of this brick wall! But at our core, we are an educational resource to the University, similar to Van Pelt Library—except that our collections are not books, but artifacts. Professors often tour their classes through our galleries. However, some topics are better examined in an intimate setting, utilizing collections that are not on display. 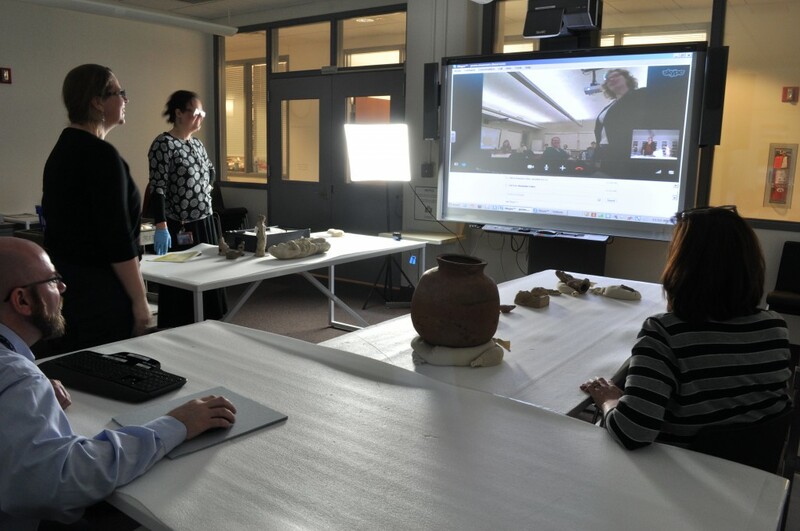 In the past, classes studying artifacts from storage were booked in various spaces throughout the Museum. But such spaces are also used for events where food is served. Food + Drink + Artifacts is a combination we strive to avoid; every museum faces the challenge of preserving its collection while also making it available to the public. To strike the balance, we wanted a space appropriate for both student engagement and material culture. 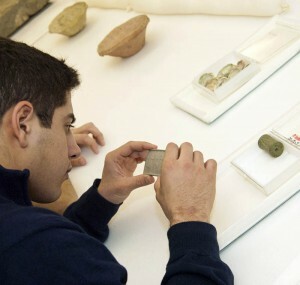 A Penn undergraduate student examines objects from the Near East Collection. 1) Location: First step was to pick a space to renovate. Did we want the room to be accessible to the public, or provide more security for the objects? Another consideration was the environment. Not all spaces in the Museum have regulated temperature and humidity, which are essential to the preservation of Museum collections (and more comfortable for people too). In the end, we chose a room on the first floor of the Mainwaring Wing that has climate control and secure access. 2) Furniture: Of course tables and chairs are necessary for classes, and a computer station for researchers—those were straightforward. But we took our time selecting the collections storage cabinets, since they are very (very) expensive. So the firm met with the Museum’s Conservators and Section Keepers to outline the type of storage cabinets that would best meet our requirements. We ended up with two textile cabinets (wide and deep with short drawers) and three tall cabinets with adjustable shelves. We sprung for glass doors on the tall cabinets, because they seemed inviting and attractive (we are trying to entice people to visit us, after all). Left, the plan for the collections study room; right, how it turned out. 3) A Soft Landing: Imagine you are an object falling from the loose grip of somebody’s hand. You probably want to land on soft carpet rather than hard flooring. The first act of renovation was providing a soft landing pad—should it be needed! For similar reasons, we line table surfaces with foam padding. 4) Technology: We had enough funding to purchase a Smart Board, knowing that we needed a projector for PowerPoint presentations and internet access to refer to online resources during classes. It has also been helpful for remote access requests through services like Skype and Google Hangout. We recently had our first experience with Coursera through a Penn course on Greek and Roman Mythology. Finally, a photography station was placed in one corner, and is used heavily by both Museum staff and researchers. Skype session with a remotely located class. Who are we? As noted above, a portion of the funding was reserved to create two new staff positions to oversee the management of the Collections Study Room. I was lucky enough to have been hired for one of those positions, along with my colleague, Jim Moss. 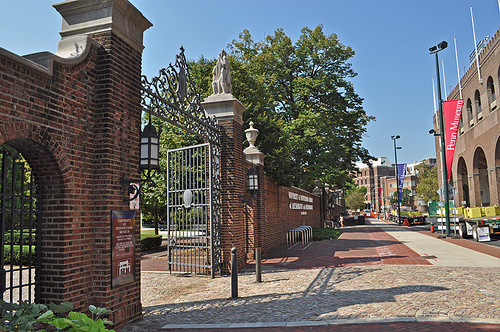 If you want to find out more about visiting us—and we hope you do—you can reach us at classuse@pennmuseum.org or 215-746-6978. It’s been a little over a year, since the Collections Study Room officially opened. We are hoping that by making the Museum’s collection more available to the University, we will see more students, groups, classes, and faculty making use of us as a resource, so that, together, we can tear down the metaphorical wall separating the University from its Museum.